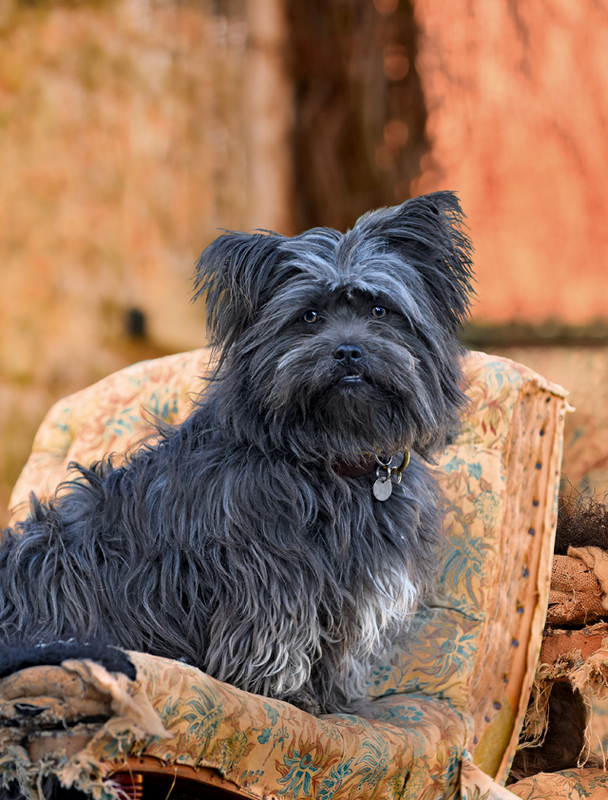 Lovable, scruffy and nearly always in trouble, this Heinz 57 terrier has won Country Life and Lily's Kitchen's quest to find the UK's most disobedient dog. Peace reigns at Luke and Alice Irwin’s picturesque Wiltshire cottage; a cockerel crows, sheep bleat in the distance and a cat sashays elegantly down the drive. Suddenly, a small, wild, ball of grey fur rockets past, sending gravel flying; the cat decides to make a run for it, with a cheeky terrier hot on its heels. This is Rabbit—all-round mischief-maker and the deserved victor of the search we embarked upon last October to find Britain’s naughtiest dog. As soon as the competition, in association with Lily’s Kitchen, was announced, our postbag filled up with owners’ fulsome descriptions and photographs of all the dastardly antics and crimes—mostly involving repeated offences in relation to theft of food—that their canine companions consistently commit. Rabbit’s portrait, featured on the cover of Country Life, March 26, 2015 issue. Since Rabbit arrived, via Battersea Dogs & Cats Home, at the family’s home in an idyllic valley overlooking the Wiltshire Downs two years ago, he has racked up a litany of daily destruction. An old armchair, countless toys, pieces of clothing and even £250 in cash have all fallen victim to his propensity for chewing. But it was an unplanned trip inside an Amazon delivery van that really took the (dog) biscuit. As the driver was dropping off a package at the door, having left the rear van doors open, Rabbit hopped into the back and buried himself among the parcels. When the driver returned to close the doors and set off to make his next delivery, he had no idea that the little dog was stowed away inside and so Rabbit enjoyed a happy trip around Wiltshire and Dorset, contentedly nibbling away on the cardboard parcels. When the driver finally realised he had an unexpected passenger on board, and witnessed the subsequent trail of destruction, he was horrified. Fortunately, Rabbit’s endearingly scruffy appearance and friendly personality not only quickly won the driver round, but also ensure that he’s soon forgiven for any misdemeanours at home. In fact, the family wouldn’t be without him. As well as getting him out of scrapes, Rabbit’s charm has won him an accomplice. Dudley, a gentle, plodding grand basset griffon Vendéen belonging to Otis, Violet’s nine-year-old brother, has worked out how to open the front door. ‘Dudley jumps up and opens it,’ Otis shrugs, ‘and Rabbit runs out.’ This simple, yet impressive, system enables Rabbit to nip out whenever he pleases to steal bones from the neighbour’s dog. As he snuggles into Violet’s lap, it’s clear that, although he’s earned the title of Britain’s Naughtiest Dog, in her eyes, he’s Britain’s top dog. ‘Which breeds do you think Rabbit is a mix of?’ I ask. Behind me, the cameraman folds his arms and huffs under his breath: ‘No doubt about it: trouble.